LGBT UNITED, a Film by CSUN Professor and Filmmaker Luciana Lagana, Will Screen in Chicago on 11/05 at Chi-Town Multicultural Film Festival. It’s a great honor for LGBT UNITED to be chosen to screen in Chicago at this diversity-focused film festival. CSUN psychology professor and social impact filmmaker Luciana Lagana’s feature documentary, LGBT UNITED, is an Official Selection at the 2016 Chi-Town Multicultural Film Festival (CMFF). It will screen in Chicago on Saturday, November 5th 2016 at 4 pm as part of a small group of films selected for their diversity-focused messages. From the IMDb’s website: (LGBT UNITED is a) documentary on the challenges encountered by LGBT individuals in their childhood, at school, when coming out, and in many social settings. The viewer will experience the multiple struggles and discriminatory experiences of this minority population vicariously, thanks to the candid interviews of many LGBT volunteers. In spite of all their challenges, their serenity and resilience is remarkable. Dr. Luciana and LGBT experts share their views on some of the many controversial topics that surface during the interviews. The result is a compelling movie that focuses on the need for unity within the LGBT community and within society, as we stand united to protect human rights = LGBT rights. LGBT UNITED has received accolades on the film festival circuit, including the California Endowment Special Sons and Brothers award for positive and balanced depictions of young men of color at the Long Beach Indie Film Festival and the Best Political Statement Movie award at the Action on Film International Film Festival. From the Chi-Town Multicultural Film Festival’s website: CMFF provides a vehicle for nationwide exposure of quality, thought provoking and envelope pushing films. It's a celebration that focuses on stories, people, and passions that are too often unexplored or honored in mainstream filmmaking. Categories at CMFF range from documentaries, dramas, comedies, music videos, sci-fi / horror, inspirational films, animation and LGBTQ stories. CMFF is the place to mix and mingle with other like-minded filmmakers while enjoying red carpet premieres and an exciting awards event that honors a film industry personality and recognizes community pacesetters. The 2016 list of the filmmakers whose work will be screened at this Chicago-based film festival can be found at http://www.cmfilmfestival.org/filmmakers-20161.html, http://www.cmfilmfestival.org/filmmakers-2016.html and http://www.cmfilmfestival.org/honorees-of-the-2016-out-of-the-box-thinkers-award.html. “It’s a great honor for LGBT UNITED to be chosen to screen in Chicago at this diversity-focused film festival. Our team’s efforts to give a voice to often-neglected minorities are being recognized beyond the California’s film festival circuit”, concluded Dr. Luciana. Luciana Lagana is a caring clinical and experimental psychologist. She is also a professor of psychology, gerontology, women’s health, and sexuality at CSUN, where she teaches classes and mentors many undergraduate and graduate students. Additionally, since 2002, she has been conducting government-funded research at CSUN on the physical, psychological, sexual, and social health of ethnically diverse, primarily low-income older women. Since 2006, she has also been pursuing her creative endeavors by studying acting, TV and radio hosting, screenwriting, directing, and producing in Los Angeles. She has over 50 IMDb credits for hosting and acting in many independent feature films, TV pilots, and web series, as well as several credits for her award-winning screenwriting, directing, and producing. She is the writer/lead actor/director/producer of the 2014 award-winning satirical web series INTIMATE TEMP AGENCY on helping young people with special needs find employment, which won Best Trailer at the 2015 Hollywood Reel Independent Film Festival, among other awards. 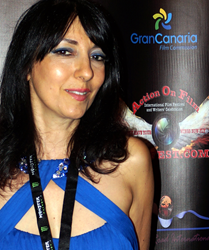 Her 2014 DR. LUCIANA SHOW – AGING AND FALLING web series won numerous awards, including Best Educational Show at the 2015 WorldFest-Houston International Film Festival. Within the past two years, her TV pilot DR. LUCIANA ON AGING AND FALLING fared well on the film festival circuit; she also wrote, hosted, directed, and produced three award-winning social impact feature documentaries, UNDERSTANDING PAIN IN OLDER AGE, LGBT UNITED, and AGING AND FALLING.